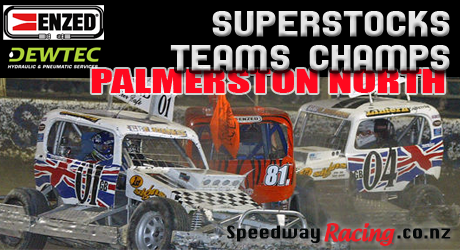 Palmerston Panthers as defending champions the will face a strong challenge from the Worlds best SuperStock Team drivers. Twelve Superstock Teams including the British Lions race for two hard, hectic days at Palmerston North Speedway, on Friday 7th and Saturday 8th in February. The Superstock Teams Champs, first won by the Palmerston North B Team in 1981. Spectators from around the world make an annual pilgrimage to Palmerston North for this International event that rivals the Rugby Sevens as the fans dress in their team colours. Plus Burger King Super Saloon Championship – Camaros, Corvettes, Mustangs, Commodore V8’s racing as if there is “no tomorrow”! Tickets from NZ$15.00 kids 8 to 15 to NZ$40.00 adults.Buy Tickets from the gate on race night or Ticket Direct. Can’t make it? Check out the Live Stream for US$40 per night. Below is the list of confirmed team lineups as at 29/01/2014. They are subject to change.